Posted on September 6, 2017 by Saurabh Agarwal. Rankings of Top University were released by Times Higher Education World University Rankings 2018. Rankings of Indian Universities have not only slipped down but also none of them were feature in the top 100 or even in top 200. World University Rankings 2018: IITs, IISc rankings dropped. Rankings of universities in the world 2018 – Indian institutes poorly performed as per the latest World University Rankings 2018 announced on Tuesday. Premiere Institutes such as Indian Institute of Science (IISc) was the highest ranked institute from country, but the ranking went down from the 201-250 bands to 251-300 position. Similarly, IIT Delhi & IIT Kanpur, which was among the best Indian institutions, now the rankings went down as compared to previous year’s position of the 401- 500 to 501-600 band. IIT Bombay, however, did not have a slight change from its 2017 ranking of university and was placed in the 351-400 position. Let’s have a look at IIT Kharagpur and IIT Roorkee which also retained the positions in the 501-600 segment. 2018 world university ranking – About 30 Universities in India made to the list of rankings of universities in the world, with Indian Institute of Science (IISc), Bangalore happens to be the only Indian University to achieve a position in the list between 251-300 ranks. IIT Bombay is the next Indian institute to make it to the QS world university rankings list 2018 and achieve a position of 351-400, a proud moment for India. Out of these two, other 4 IIT’s are in the line, having their rank between 501-600. In QS World Ranking too, though Indian Universities have secured better ranks but overall performance is not up to the mark. Speaking of rankings of universities in the world 2018, there are 20 indian universities. 8 of them are features in TOP 500 and 3 in Top 200. 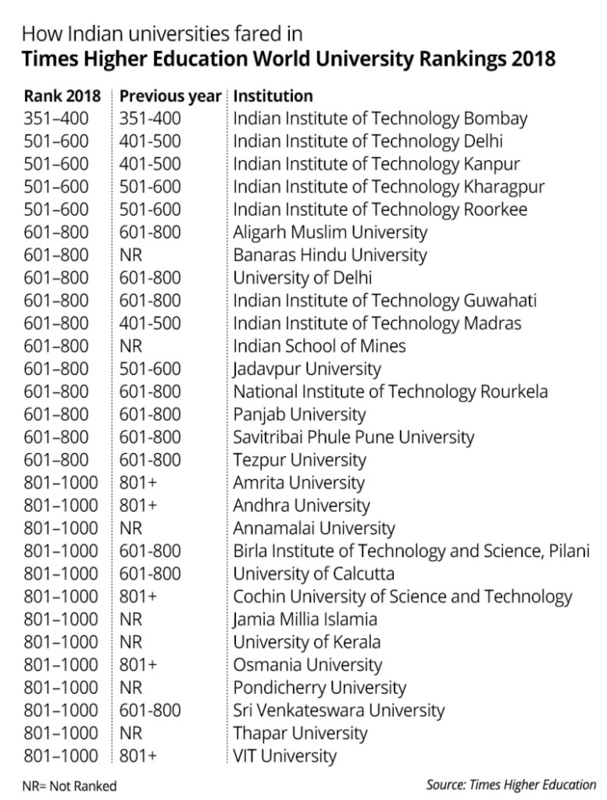 Those 3 institute which were in top 200 include IIT Bombay, IIT Delhi and at the Last IISc Bangalore. World university rankings 2018 QS – Premier institutes in india such as IITs and IISc having lakhs of students competing every year to get a seat in undergraduate programs offered and having prestigious alumni including Sunder Pichai, N. R. Narayan Murthy, Sachin Bansal, and Vinod Khosla. So what could be the possible reason for Indian Universities faring poorly in International rankings? The survey conducting authority has also announced the QS world university rankings by subject 2018 and also by world university rankings 2018 by faculty. Students can check their official websites at the end of the article more references. These rankings also consider the number of undergraduate students at a University which helps in explaining the fact that why none of the IIMs or IISER makes it to the rankings of universities in world 2018. The rankings also depend on an institute’s research output, citations received by the faculty, funding on research, ratio of student & teacher etc. When it comes to research funding & citations, Indian Universities again receiving an end. Most of the prestigious institutes in india cater to one particular stream such as engineering or management etc. which tends to reduce the volume and variety of research. Since the intake of students & faculty is also smaller in comparison to the top ranking universities of the world, the numbers of research citations are lesser comparatively. 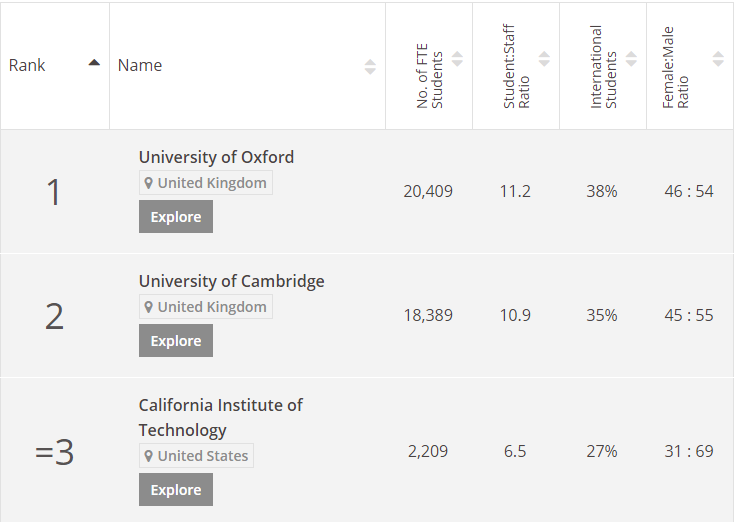 Both THE world university rankings 2018 and QS World University ranking 2018, consider the amount of international students at an institute and the no. of international faculty, where Indian universities lack. It cannot be contested then, that Indian Universities along with Indian education system need to adopt a change and improve their focus on research & research funding and internationalization of Indian campuses, if India wants to rank higher.